Booking.com: The largest selection of hotels, homes, and vacation rentals. Book now, pay later, and free cancellation on most rooms. Whether you’re looking for hotels, homes, or vacation rentals, you’ll always find the guaranteed best price. Booking.com boasts over 1.3M accommodations, 20+ property types in 224 countries and 121M+ verified reviews. Use of any Booking.com refer-a-friend links, or any coupons and/or incentive offers/links (including Amex/Mastercard/Visa discounts) will invalidate any cashback and/or any cashback claims, including our cashback guarantee, unless specifically listed on this site. Your transaction amount will display in EUR in your My Rewards. Your Cashback amount will be converted to AUD. Cashback is only eligible on accommodation bookings. 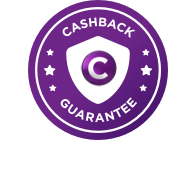 Any non-accommodation bookings (flights, car rentals, etc) are not eligible for cashback.